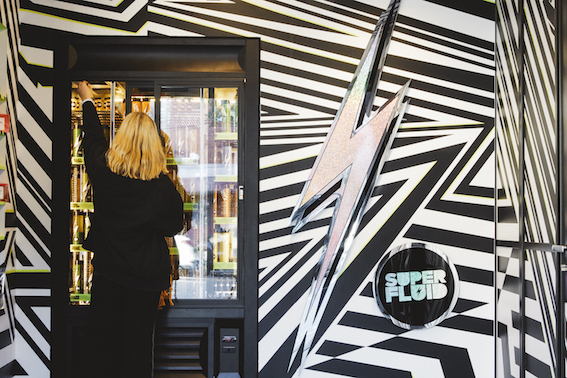 A true disrupter in the pressed juice space, Superfluid opened its second store Tuesday 12 June at the rear of Hotel Electric, the former Gertrude Hotel in Gertrude St, Fitzroy. While Hotel Electric is still a few months off opening, Superfluid owner Tracey Lester just couldn’t wait to expand her new vegan organic juice bars and plant-based eatery. The new juice bar has an entry on Napier Street and at first will feature a ‘grab and go’ menu with outdoor tables until it finally expands into a fully-fledged café and rooftop. Lester has also launched her new range of adaptogenic* blends that go into smoothies, coffee and more. The new Superfluid will feature an expanded vegan menu from chef Tristan Newman of hot food including not-bone broth, veg curries, salads and a selection of raw and baked desserts. The first Superfluid café opened on the ground floor of the iconic Carlton Club in Bourke Street in October 2017. Superfluid aims to disrupt the notion that you can’t be healthy and have fun at the same time. Served in a cool and creative environment, these ‘functional’ juices and foods have medicinal and health properties, transcending anything currently available in Australia. Known to friends and colleagues as “the healthy party animal”, Tracey Lester has been the queen of having fun healthily for decades. An expert in detoxes, superfood, mood enhancing supplements like adaptogens*, alternative therapies and integrated medical approaches, Tracey is the go-to for Melbourne’s hospitality entrepreneurs, fashionistas and artists who regularly ask for expert advice in health, beauty, flower essences, nutrition, and adaptogens. *adaptogens are herbs, compounds or substances that can have a physiological effect to promote homeostasis, or balance in the body. They will “adapt” and prioritise themselves to address the greatest stress demands needed within a body e.g. increase energy, brain function, elevate moods, combat insomnia and hormonal imbalances, promote skin health, increase libido and liver function.